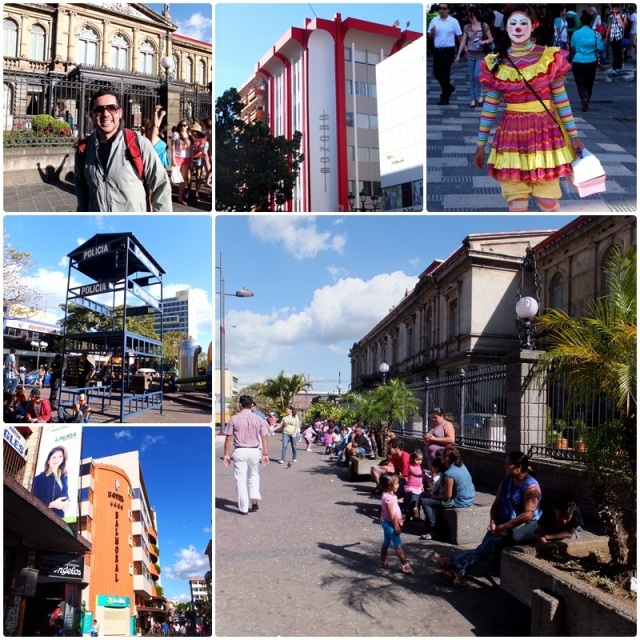 An enjoyable 20 minute walk through the Barrio Chino had taken us from our hotel to the downtown area of San Jose, Costa Rica. Right in the heart of the city, at the intersection of Avenida 2 and Calle 3 are two important landmarks of the capital: the storied Gran Hotel Costa Rica, and the opulent Teatro Nacional, the pride and joy of Costa Rican culture. A small square connects the two famous buildings, and locals and tourists are always seated on the stone benches under a few shady trees. Two of our friends from our 10-day Costa Rica tour were staying in the Gran Hotel Costa Rica and we were planning to meet up with them in the evening to enjoy dinner and some live music in the hotel’s restaurant. 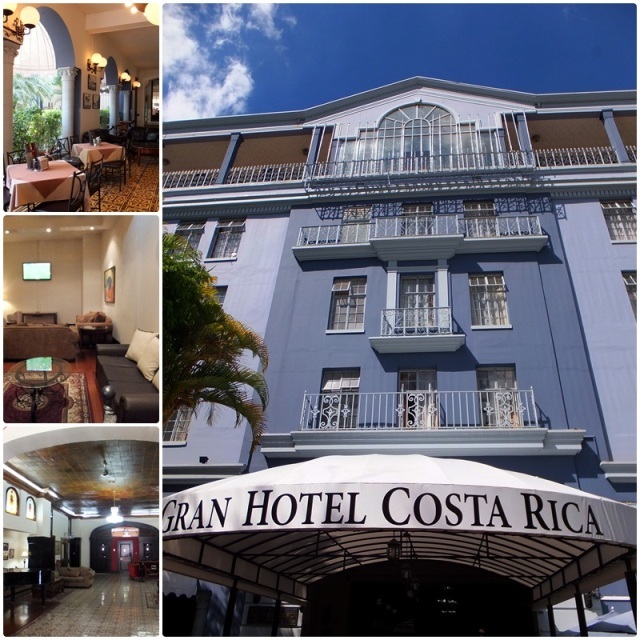 The Gran Hotel Costa Rica is truly one of San Jose’s most famous landmarks. Opened in 1930 as the very first top-class hotel in the country, it is located right next to the Teatro Nacional and the Plaza de la Cultura, the main square of San Jose. It has hosted famous guests such as Presidents John F. Kennedy, Jimmy Carter, John Wayne, Julio Iglesias and many others more. We had a peek at the restaurant and the lobby and admired many of the historic photos on the walls. Then we took a walk around the Plaza de la Cultura, the large square at the heart of San Jose, Costa Rica, that was built between 1975 and 1983. The square was bustling with activity and full of local families, teenagers and children. Several street performers had set up shop and were entertaining small crowds. The next item on my itinerary was to actually check out the Teatro Nacional, Costa Rica’s National Theatre. Built between 1891 and 1897, the Teatro Nacional opened with a performance of “Faust” by Johann Wolfgang von Goethe. 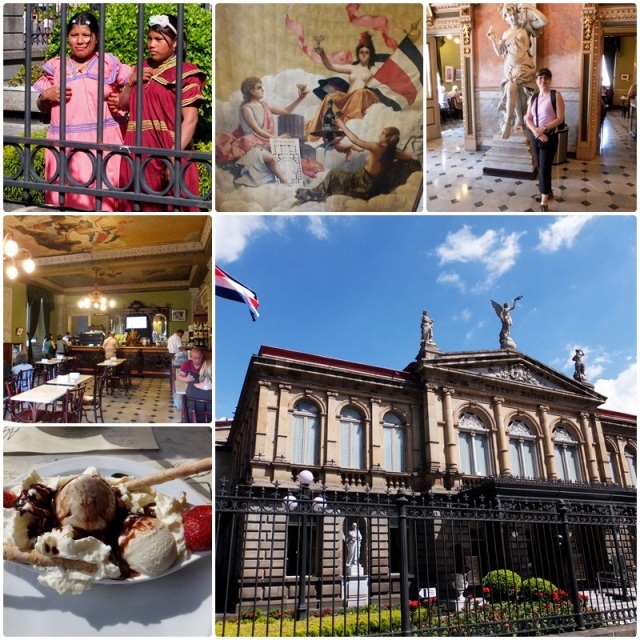 It was partially funded by revenues from coffee exports and is considered to be the finest historic building in San Jose, Costa Rica. Before venturing on a guided tour of the Teatro Nacional in San José on February 17, we sat down in the Alma de Café, a gorgeous European-inspired coffeehouse inside the National Theatre. The classic decoration is reminiscent of early 20th century Vienna and my strawberry crepe was delicious. 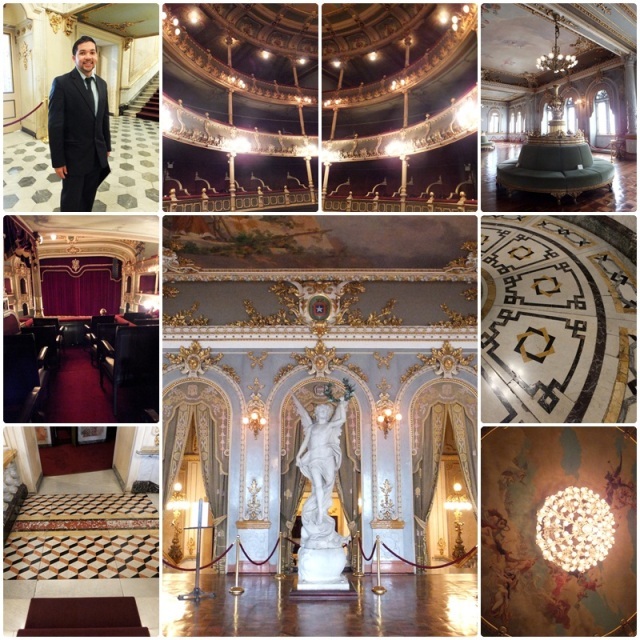 After this sweet interlude I was read to explore the Teatro Nacional which is best enjoyed with a guided tour. Local expert Jeff Meza took our group through Costa Rica’s most venerable theatre. No expense was spared in the construction of this structure, the finest historic building in all of San Jose. The plans for this venerable theatre were actually conceived when, during the late 1800s, a Spanish opera singer declined to perform in San Jose due to the lack of a suitable venue. As a result of this snub, the ruling coffee barons of the time decided to build a grand theatre that would be financed with a levy on coffee. The exquisite interior includes Italian marble staircases, parquet floors made of 10 species of hardwood, and exquisite sculptures by European artists. A Coffee Mural painted by Aleardo Villa from Milan includes a number of historic inaccuracies, given the painter’s lack of local knowledge. Among various errors, the wall painting shows coffee being grown as a coastal crop while it is actually grown in the highlands. The roof of the theatre is decorated with three large allegorical statues that represent Music, Dance and Fame. A small formal garden in the front of the building features a life-size marble statue of a female flautist while statues of Ludwig van Beethoven and Calderon de la Barca, a 17th century dramatist, are recessed into the façade of the theatre. The entrance lobby of the theatre is equally impressive, with a pink marble floor and bronze tipped marble columns. The foyer of the National Theatre can be accessed via a double staircase with gold-gilt banister. This impressive room is decorated with pink marble, gilt mirrors, crystals and many gold-leaf ornaments. Various murals around the room depict life in Costa Rica. The red and gold coloured auditorium has a stunning rotunda ceiling with paintings of deities and cherubs. The stage itself can actually be lowered and raised, depending on the type of performance. Local expert Jeff gave us a tip and mentioned that the Teatro Nacional is home to many different musical performances, some of which can be enjoyed from about $3 and up. Jeff mentioned that he does city tours as well and at 4 pm he had a walking tour of San Jose scheduled. I signed up right away, as a guided tour is an excellent way to get to know a new destination. I was looking forward to learning more about San Jose, Costa Rica, from a local expert.